Whenever we hear the term home refurbishment in today’s age, our thoughts are instantly drawn to large scale and Eco-friendly modifications such as home insulation and the installation of solar panels. Refurbishing your home can also include a range of smaller and simpler tasks, however, such as redecorating your child’s or bedroom or simply infusing it with additional color or character. The quickest, easiest and, most certainly, the cheapest way of brightening up your child’s room is to get them to do it themselves! This does not necessarily mean letting them loose with tins of paint, brushes and rollers, of course, but instead affording them a degree of creative input while also guiding their decision making. Growth charts are a useful way to decorate your children’s room. After all, your little ones love to see how tall they are getting and they are a helpful way for you to keep track of their development. There are many fun themed growth charts on the market, or you can easily make a really personal one of your own. Lamps are another great way of brightening up a child’s bedroom. You no longer have to get the usual plain light, as they now come in some cool aesthetic designs and a host of unusual shapes and sizes. Some of the more ingenious ones include the memory balloon floating light which is, as the name suggests, a brightly colored and distinctively shaped light that can be attached to either the ceiling or the wall. On the topic of unusual lighting, why not invest in wall mounted fittings that can cast variable and subtle shades of light in your child’s bedroom? There are some spectacular floral designs that come in a range of colors, meaning that your child can enjoy various tones to suit their decor. If your child is having difficulty remembering their alphabet or perhaps getting muddled with their math, the interior of their room could be the key to helping them. You could not only brighten their room but you could also help them to learn their letters and numbers organically over time. On a similar note, you may also want to incorporate letters or monogrammed images in a more creative manner in your child’s bedroom. These can be adorned on the walls to spell out specific words or your child’s name, while you can also use a range of fonts and colors to infuse additional character into the room. 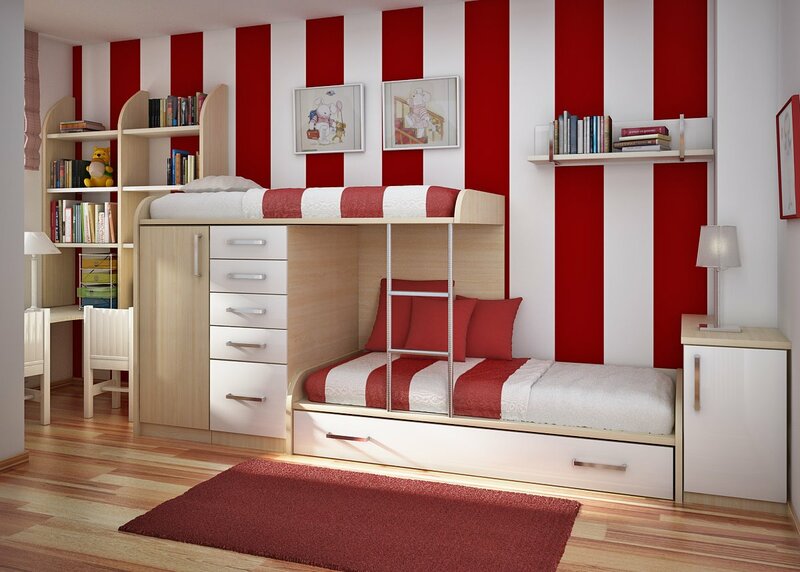 If you are keen on adding further texture your child’s bedroom, you could incorporate stencils or wall decals. Wall decals are essentially stickers that are made from vinyl and designed to be secured on smooth, interior walls. They offer a smooth, malleable surface that that can be decorated or embellished with different colors and textures, while there are others that include specific imagery if required. If your child has a favorite television show or cartoon character, these can be used as inspiration for a fun and engaging interior design theme. Even if your child does not have a preferred television show or carton icon, you can invest in universally popular concepts such as a blue and sea creature inspired underwater theme or a sporty design that includes the colors of your child’s favorite team. A chalkboard wall is an excellent addition to your child’s room, as it is simple to create and can be adapted to suit your child’s changing needs. To create this, you simply need to apply erasable and washable chalkboard paint to a smooth surface, before embellishing this with a painted border, some decorative molding and of course your child’s drawings! If you decide to avoid adorning your child’s walls with custom drawings or paint, you may want to enlarge your favorite family photographs and use these to create a super-sized mural. These can reflect natural images of you and your children at play, while creating a unique interior that provides an inspiring backdrop for your child’s upbringing.